We have gazed in wonder at the treasures that were found in Tutankhamun's burial chamber for almost one hundred years. In reality he was a boy king whose rule was very short, and his burial a hurried affair. What treasures or history would have been found in an intact tomb of Tuthmosis III or Rameses II? The ancient grave robbers stole from us more than gold and gems. Between the Middle and New Kingdoms Egypt was prostrate under the invaders we call the 'Hyksos'. Their names are Semitic in origin, so it is assumed that it was also their heritage. So the proud Egyptian people who built the pyramids etc. were beset, and half of their country was conquered by outsiders. 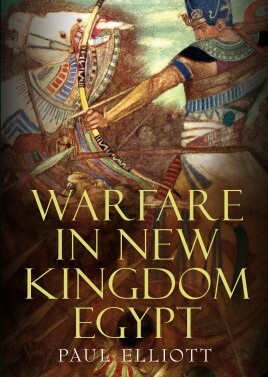 The book starts with the Egyptian fight to regain control of the northern part of their country. Then it continues with the founding of the New Kingdom by the pharaoh Ahmose. The book itself is small at 140+ pages, but it is filled with all we know at present about warfare in that age. It comes with maps and illustrations, and fourteen pages of colored photos. This was an age where Egyptian armies strode over a large portion of the Middle East. The book also goes into the other Egyptian enemies: the Mitanni, Hittite, and the Sea Peoples. The New Kingdom seems to have been born and died under different foreign invaders. The campaigns of the 'Napoleon of Egypt' Tuthmosis III are gone into along with those of Rameses II and other pharaohs. The nuts and bolts of these campaigns are shown to the reader. The book also goes into the simple soldiers' lot in life, along with all of the different weaponry he used. The Egyptians had not known of the chariot before the Hyksos invasion. However, they quickly became masters of chariot warfare. Mr. Elliot has written an excellent primer on the warfare of the time. Hopefully the book will make the reader explore more of the history and personalities of the age.